In the United States, 75% of a wine must be from a single grape to be considered a single varietal. 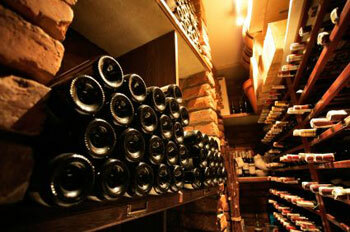 The remaining 25% allows the wine maker to change the character of the wine by adding grapes of differing types. For instance, many Cabernet Sauvignons have a significant percent of Merlot to soften them and often several percent of Petit Verdot to add character. Wines that drop below 75% of any grape variety are considered blends. There are several blends that have gained notoriety world wide. Bordeaux is a usually a mix of between 4 and 6 different types of grapes from the aforementioned region in France. No other wine can be called a Bordeaux because of long standing trademark and trade laws. That does not stop wine makers from other regions from making the same style of wine, often with spectacular results. In the mid eightes, a group of Napa wine makers created the term Meritage to signify a Bordeaux style of wine. In reality, there is little difference between a Meritage and a Bordeaux other then the respective protected names and the source of the wine. There are a limited number of traditional blends that carry well known monikers. Modern vintners often experiment mixing grapes of vastly different origins and so create blends that live nowhere else. Only the traditional blends are described here. To find wines that are used in common blends, click on the “Encyclopedia Varietal Report” button, (2nd button down on the left) and use Winery-Sage.com’s powerful database and filter tools to find the perfect Varietals.